The DC series of sealed subminiature microswitches from ZF are single pole, single or double throw switches with a subminiature size of 20mm (w) by 10mm ((h) standard) or 16.2mm ((h) with connecting leads) and 6.45mm (d). The DC series come with a choice of pre-wired, solder, quick connect or PC pins in a variety of configurations. Electrically rated up to 10A at 250VAC with a mechanical life of up to 1 million cycles and sealed to an IP67 rating. The DC series is available with a wide variety of metal or plastic straight, roller or simulated roller lever actuators with an operating force of 200cN up to 340cN depending on model. 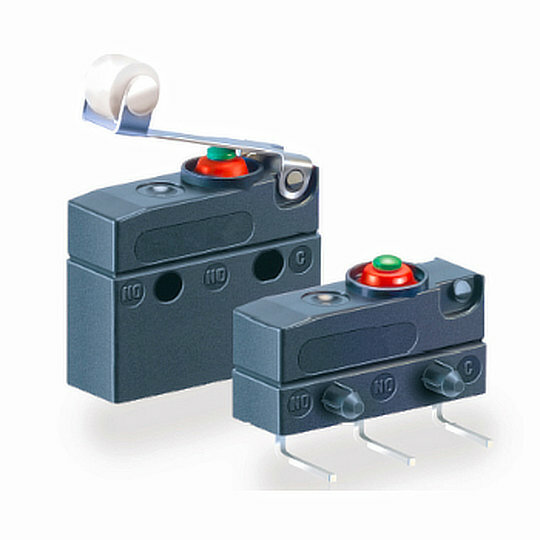 The DC series are perfect for applications such as Home Appliances, White Goods, Linear Drives, Pressure Switches, Pneumatic Valves and Float Switches.